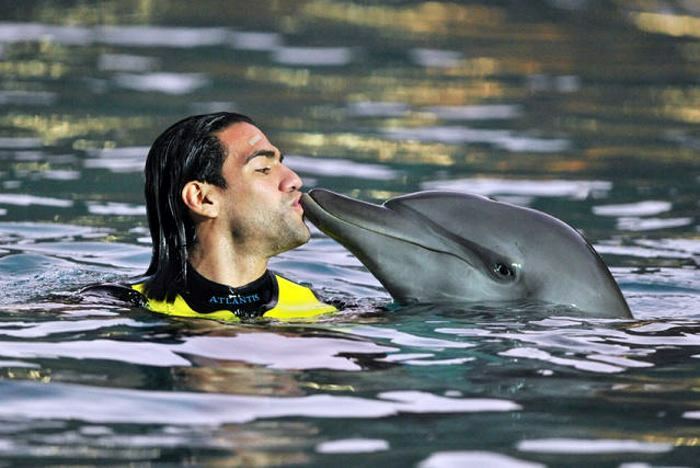 El Tigre, kissing a dolphin. "The Best No. 9 in the World", there's no doubt Falcao is a big reason Atlético Madrid and the La Selección de Colombia both accomplished great feats this year. You could point to many of Falcao's 41 goals in 51 overall appearances in 2012/13 as to why Atlético are in the Champions League and Colombia is going back to the World Cup for the first time in 16 years, as a seeded team no less. If you look up "nose for goal in the dictionary", you'd find of picture of Falcao's nose. But does his goal tally compete with the 62 and 75 of Ronaldo and Messi, respectively? Nope. And now, it's all a bit awkward for the 27-year-old (or so we think!) as he's playing in the French tax h(e)aven of Monaco in front of an average crowd of 8,000. Racist. Cannibal. Cheater. Villain. These are all things Luis Suárez has been called in his career. But 'Crappy Footballer' certainly isn't one. Loco Luis is a magician with the ball at his feet, or head. See here for examples. On the pitch, he personifies the 'stick-to-it-ivism' that has come to define Uruguayan footballers...in English anyway. Not sure there's a Spanish translation for that. In 2012/13, he scored 30 goals in 44 appearances for Liverpool, before having a chunk bit out of his season after he tried to do just that to the arm of Branislav Ivanovic. Suárez can impact a game in the same way Messi and Ronaldo can. But as good as he is, the Ballon d'Or will not fall into his hands. But he'd probably prefer to steal it anyways. If Heath Ledger and Clark Kent had a test tube baby, the result would be the genetically superior human that his Edinson Cavani. In 2012/13, Cavani plied his trade for Napoli in Italy and alongside Luis Suárez for Uruguay, scoring a total of 40 goals in 46 appearances. Bizarrely, the same little town in Uruguay has produced two players on this year's Ballon d'Or shortlist. Whatever's in the water in Salto, Uruguay, I'm feeding it to my child from birth. One of two defenders on this year's list, Thiago Silva's spot is well-deserved. Arguably the best centerback on the planet, it says a lot that PSG shelled out 42 million euro to lure him from AC Milan. Pace, passing, and compatibility define his abilities. This year in Ligue 1, he's completed 93% of his passes. Last season, in 39 appearances, he helped keep 22 clean sheets. And maybe more importantly, Silva has proved he can play alongside anyone. Does the Brazilian stand a chance to win the Ballon? No. In fact, the only defender to ever be one of the three finalists was Fabio Cannavaro in 2006. 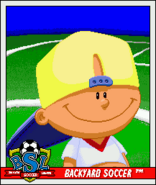 Due in part to his amazing footballing ability, but mostly for his striking resemblance to Pablo from Backyard Baseball, at 21 Neymar is this year's youngest nominee. The Fluminese striker-turned-Barcelona starlet scored 41 goals in 48 appearances for club and country in 12/13, albeit, the former occurred in Brazil. No discredit to his skills, but you can't compare that to his colleagues playing Europe. But we could make the daring prediction that though he won't win the Ballon d'Or this year, he'd be a good bet to take home the award in the future. After he kills Lionel Messi. 75 Goals. 59 Appearances. 26 years old. Una pulga. The three finalists will be announced in early December. 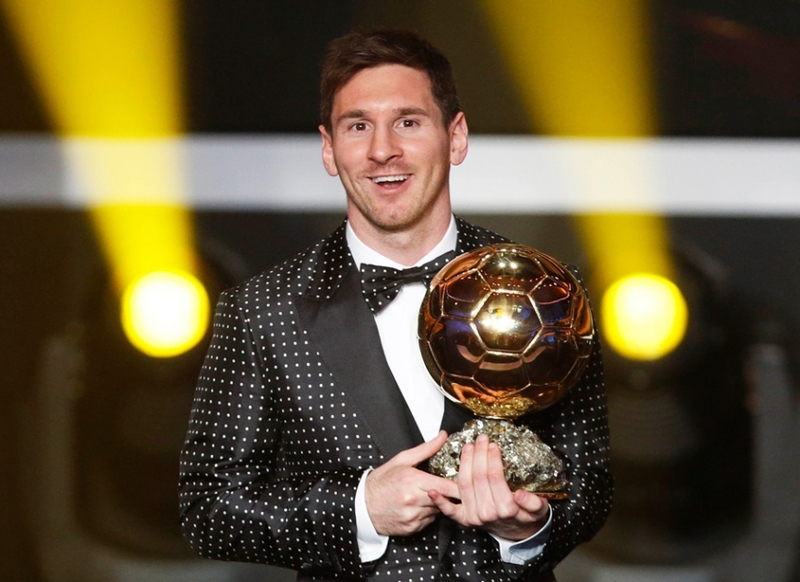 Messi gets his 4th consecutive Ballon d'Or on January 13, 2014.